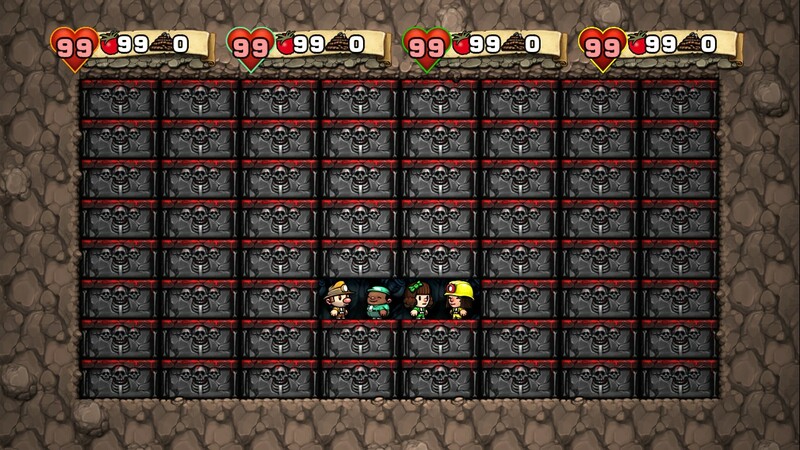 As I mentioned in another thread, I've been working on a simple editor to change the Deathmatch Arenas in Spelunky. I haven't had enough time to make something polished, but the current version should work fine nonetheless. 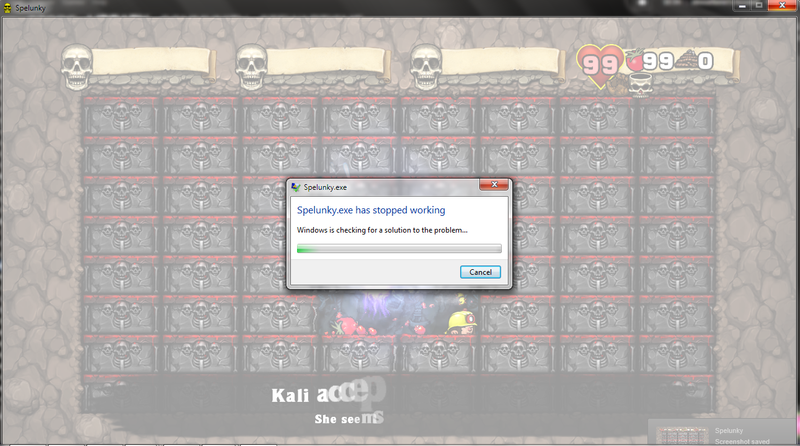 This editor will directly modify Spelunky.exe and the english localization file. I take no responsibility in whatever could happen because of this! 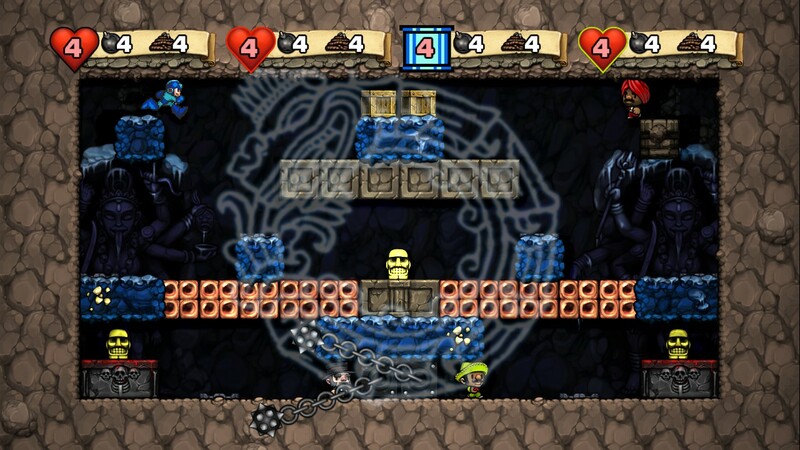 To save a level, make sure to hit "Save Level", and then when you have changed all the levels you wanted to change, hit "Apply to Spelunky.exe"! Usage is pretty straightforward: left click to draw the selected tile, right click to erase. You can also save levels to .lvl files and thus easily share them. They have to be in the 'Levels' folder for the program to be able to load them. 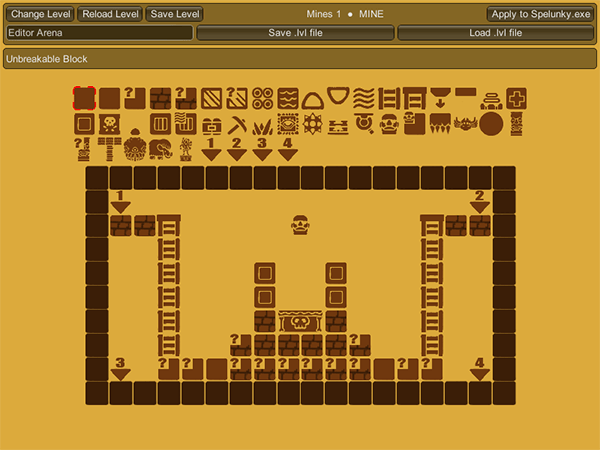 The editor has been made with Unity, which is clearly not designed to create such tools; that's why the interface is ugly, and that you have to manually set the path to Spelunky.exe (I couldn't create any menu for the application!). It also explains why such a simple tool is around 18 Mb uncompressed! Also the DLC files are still there but you can't play them in the regular game (through normal means), what is up with that? Wow! Looks neat! Too bad it's only for Deathmatch stages, but that is alright! Now, who would create Bomberman stages here? * The "Classic" Music Tracks! * The "Walrus Lady" for good measure! Ok i made my first proper Deathmatch arena. Wait... It's Done!?! YES, IT'S DONE!!! IT'S DONE!!! IT'S DONE!!! IT'S DONE!!! YEEEESSSS!!! But the download is stopping at 5.1MB, every single time. @Blaze06h: I tried to download it and it worked. Try this link maybe? @Subscriber01236: What do you mean about the DLC arenas? 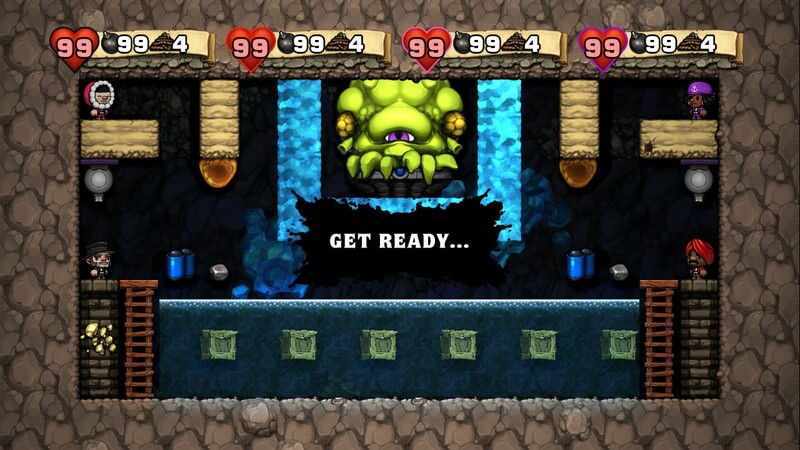 They do appear in my version of Spelunky. By the way, I've only tested it with the Steam version but it should work with other versions as well. Can someone confirm this please? Strange... it does 5.1 MB in seconds, but then it stops with 0 kb/s! If you don't mind... can you upload it in some other place. BTW, that's the link I used. Edit: Forget whatever I said before, I tried downloading it again and it took me 0 second! Since I already downloaded it so many times, my browser automatically saved the file up to the amount I already downloaded i.e. 5.1, then it just downloaded the rest 0.1 MB. So, problem fixed! Have you looked into where the other pre-defined levels are (adventure lobby and tutorial stages)? It could be fun to edit those as well. By golly it works! Very impressive. Although it makes me long for a full scale level editor even more. I haven't found the predefined ones but I did manage to edit the generated levels directly with an hexadecimal editor; but a proper editor for this would take time because we would need to reverse-engineer the whole level format, find exactly how the procedural rooms are laid out, and see if it wouldn't interfere with the daily challenge to prevent cheating. While we wouldn't be able to choose which rooms would randomly get selected (i.e. create custom-made levels), we could theoretically edit these rooms to alter the game (make it easier, harder, or just different for example). "This is gonna be funny"
Now you've just broken the game (literally).